I-AM offer a great service. They are quick, efficient and thorough in the work they produce. On top of that the team is great fun to work with. We’re delighted with the brand they have created for us! I-AM were approached by Gailarde – one of the industry leaders in UK household textiles & linens – to help them create a new online luxury retail brand. By drawing on nearly 40 years of experience, they curated the very best products from around the world for this luxury offering. 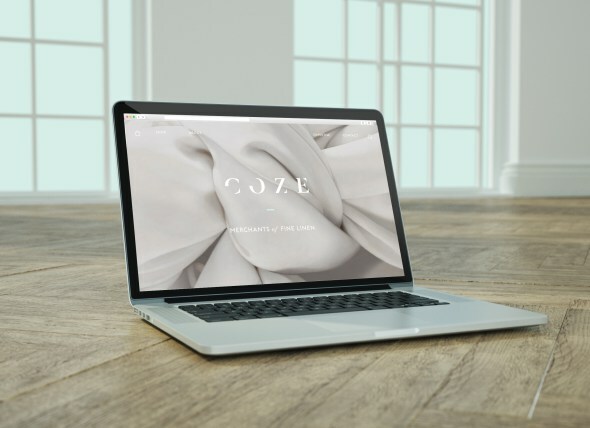 By first outlining the direction of the new brand as ‘luxury linen with a unique charm’, I-AM then created the name for the brand – COZE. The core concept likens the brand to a guild of merchants – a family who have been travelling the world for generations, learning their craft and sourcing the very best linen & textiles. We took a modern twist on this idea by using a understated but fresh palette, whilst also focusing on the detail of the fabrics to communicate the sensory feelings of tactility and touch. Alongside creating a responsive retail website and branded collateral, I-AM were also responsible for conceiving and art directing all film and photography for the brand. Following the launch of COZE, I-AM has an ongoing relationship with the founders, looking after their Brand Communications on a retained basis. Our work involves creating awareness to help raise the brand’s profile and to build relationships with the right and relevant key press and opinion formers. In addition to this, I-AM have also been commissioned to work on other brands in the Gailarde portfolio.